DIGNA constitutes a fully automatic, easy-to-use tool, accessible via web and ready for self-learning. Nowadays it is indispensable for Healthcare professionals to count on prediction applications that help medical professionals improve patients care and, consequently, their health, besides optimizing healthcare resources to get a more efficient clinical management. DIGNA is an intelligent alerts system providing support to medical specialists for the development of protocols, early diagnosis, prognosis of the evolution of diseases, and planning of treatments for their patients. DIGNA allows creating instances for different medical conditions. This system is based on applying descriptive analytical techniques to infer prognosis in the form of recommendations, and set an early detection alert system. DIGNA has essential functionalities implemented for collecting, processing and visualizing medical information from heterogeneous data sources. The web interface of the management system offers a controlled access through password with safe protocol, and data can be recorded and descriptive reports created automatically. On the basis of the data previously gathered, machine learning techniques are applied on the prediction module to get suggestions on diagnosis and create individual alerts if necessary. Finally, healthcare professionals will judge and validate these alerts. The reports module allows specialists to visualize the results of the techniques applied to data existing on the system, and study the reason for alerts. The most relevant information on phenotypes, different variables and relations underlying them is provided in graphs. DIGNA extracts the most relevant information, suggests diagnoses and individualized alerts and offers prognoses. 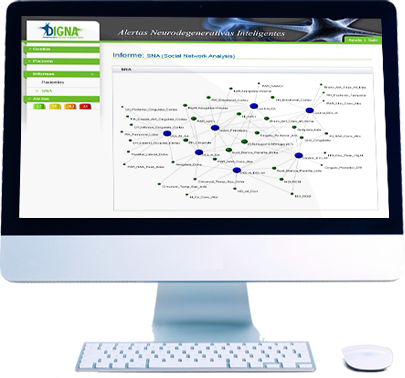 In addition, DIGNA incorporates advanced visualization techniques, such as Social Network Analysis techniques, facilitating specialists to interpret results. It stores information from patients anonymously and allows safe access through the web. Finding patients is easy as there are different filters such as patient code, age, initial sign up date, etc. For every new patient, it suggests a diagnosis based on analysing historical data validated by specialists. It warns professionals if certain criteria are met, demanding an extra revision from them. After all data are loaded, it re-evaluates the stored information in order to update the system knowledge. It displays a graph summarizing the most relevant information for the diagnosis or research on the development of the disease. DIGNA algorithms, carried out by IIC team of experts, are adapted, enhanced and renewed at the request of healthcare professionals. Besides, analysing data from different sources or centres leads to discoveries and alerts for individual scenarios, what has already proven to be useful in Primary Care. DIGNA, a prerequisite for the ADMIRE alerts system, proved to be a fully automatic tool and ready for self-learning, during the first pilot study developed by Grupo de Demencia de la Comunidad de Madrid (DEMCAM). In this study, 4 groups of patients were suggested: Cognitively Sane patients (CS), Amnestic Mild Cognitive Impairment (A-MCI), Multi-Domain Mild Cognitive Impairment (MD-MCI) and Alzheimer Disease (AD). In this study, DIGNA could evaluate the risk of each new subject belonging to one or another group. The accuracy achieved in distinguishing CS from AD was over 95%, and in the case of MCI and AD was higher than 90%. Considering 238 variables involved in the study, DIGNA selected the 10 most relevant ones automatically and could determine, according to the phenotype of the patient, the most efficient Magnetic Resonance Imaging techniques to detect significant differences between the groups. For instance, the technique of reflection anisotropy spectroscopy proved to be a good differentiator between CD and A-MCI phenotypes; nevertheless, results were poor when differentiating between MD-MCI and AD. While volumetry proved to be the best technique for all groups in general, the best result within every group was obtained by combining information obtained from volumetry with information from diffusion tensor imaging. Selecting the best technique allows reducing the time spent to do the magnetic resonance imaging, providing an advantage for both the patient and the healthcare centre as well. Healthcare professionals have a high volume of medical data available from which valuable information might be extracted, but their volume and variety are an obstacle to their process, and consequently, to the possibility of inferring knowledge underlying them. DIGNA constitutes a fully automatic, easy-to-use tool, accessible via web and ready for self-learning to help healthcare professionals follow the evolution of a disease. DIGNA classifies initial data sources according to their relevance, selects the most useful information using SNA techniques and sends automatic alerts and recommendations. DIGNA is 100% IIC technology and it adapts to clients’ demands. This permits us to generate several instances with different clinical techniques to diagnose a disease. Hence data obtained from MRI were used at the instance generated for the DEMCAM project, while the ELMO project instance (Estudio Longitudinal Multicéntrico Observacional) required another kind of clinical tests. In both projects, however, the objective was the early diagnosis of the Alzheimer’s disease. DIGNA may be used at private companies and public institutions from the Healthcare sector: local healthcare services, pharmaceuticals, hospitals, medical research groups, units focused on specific conditions, pro-health foundations, etc. DIGNA classifies initial data sources according to their relevance.